As an athlete, mother and survivor of a head injury, Kirsten can offer a unique perspective in how massage therapy can be useful. Kirsten discovered chair massage in the workplace in 1985, finding not only relief from intense headaches but also a boost and energy and morale. After recovering from a serious accident 1997, Kirsten found massage to be very helpful in the process of rehabilitation. "The deep relaxation, and acute muscle tension relief found in Massage therapy reduced anxiety, physical, pain, insomnia and depression, allowing me to rebalance my life. I was able to exercise, which boosted my confidence, and helped me to participate in work and family life in a more meaningful way. It is now my mission to offer this help to others. My practice is in support of relaxation and movement. When these aspects of life are in balance your possibilities are limitless." In 2002, I began my studies at The Vermont Massage Institute, focusing on Swedish Massage Therapy. Since then, I have studied many modalities, both near and as far away as Beijing...twice. In 2003, I opened my first practice at Essex Physical Therapy, where is very positively influenced by the skilled PT's. In 2004, I began working with chiropractors Dr.Kelly Rybicki and Dr. Cory Pike, where again I was very positively influenced and impressed by the way alternative medicine supported the body's ability to strengthen and heal. In 2005, I continued chiropractic assisting with Dr. Heather Conolly in Montpelier, and began private practice in central Vermont. In 2007, I began studying Reiki at the John Harvey great Institute in New Hampshire. Reiki, a Japanese healing technique is often added into other modalities especially in the hospital setting. In 2007, I attended classes in Beijing held at the Olympic Training Center Sports Medicine Hospital. There, I studied a form of Chinese massage called Tui Na, with a sports massage focus. 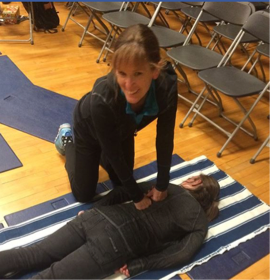 I found this form of massage to be very versatile and efficient, and integrated some of the eight Main techniques in to the chiropractic setting and into an on-site therapy offering at the University of Vermont for both faculty and students, which is still on-going. In 2010, I returned for advanced training at the Orthopedics Hospital in Beijing, studying specifically, manual therapy treatments for cervical spondylosis, L4 and L5 related low back pain, and massage treatment methods for insomnia and headaches. In 2011, I began studying Oncology Massage Therapy in Boston with Tracy Walton. For three years I provided oncology massage therapy two patients receiving treatment at the Vermont cancer center. On occasion, I still enjoyed going back to hematology oncology as a volunteer. " In addition to private practice, at the 1 Kennedy Drive location, Kirsten is an approved provider, with NCBTMB, the National Certification Board of Therapeutic Massage and Bodywork, for continuing education for other massage therapists.